When Do Rural Roads Benefit the Poor and How? Nairobi, 10 February—The 24th session of the UN Environment Programme (UNEP) Governing Council/Global Ministerial Environment Forum (GC-24/GMEF), which convened from 5-9 February, in Nairobi, Kenya, focused on emerging policy issues of globalization and the environment, and UN reform. GC-24/GMEF adopted 15 decisions, including an agreement to establish an ad hoc open-ended working group to assess options for enhanced voluntary measures and new international legal instruments on mercury. More. 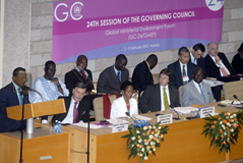 Photo: Dais during the opening session of GC-24/GMEF. L-R - front row: Rachmat Witoelar, Indonesia's State Minister for the Environment and outgoing GC/GMEF President; UNEP Deputy Executive Director Shafqat Kakahel; Anna Tibaijuka, UN-HABITAT Executive Director; UNEP Executive Director Achim Steiner; and Moody Awori, Vice-President of Kenya. Bali, 17 February—The Country-Led Initiative in Support of the Multi-Year Programme of Work (MYPOW) of the United Nations Forum on Forests (UNFF): Charting the Way Forward to 2015, which convened from 13-16 February 2007 in Bali, Indonesia, developed guidance for the seventh session of the UNFF (UNFF-7) regarding: the structure and substance of the MYPOW; inter-linkages between the MYPOW and the non-legally binding instrument (NLBI) on forests; strengthening the regional dimension in the work of the international arrangement on forests through the MYPOW; and possible approaches to accomplishing the global objectives on forests and the new principal functions of the UNFF. More. Photo: Jose Doig, Peru, Co-chair of Working Group 3 (WG3) on the "Regional and sub-regional Dimension," noted that the purpose of the working group was to link ongoing regional work with the UNFF. Montréal, 24 February—The third meeting of the Open-ended Ad Hoc Working Group of Legal and Technical Experts on Liability and Redress in the context of the Cartagena Protocol on Biosafety, which convened from 19-23 February 2007, in Montreal, Canada, focused on a working draft prepared by the Co-Chairs synthesizing proposed texts and views on approaches, options and issues identified pertaining to liability and redress in the context of Article 27 of the Biosafety Protocol. Delegates expressed satisfaction that this meeting had achieved progress in preparing to enter the negotiating phase at the Working Group’s next meeting, to be held in Montreal in October 2007. More. Photo: A Memorandum of Understanding between the Convention on Biological Diversity (CBD) and the International Civil Aviation Organization (ICAO) was signed during the meeting in Montréal. L-R: Taïeb Cherif, Secretary General of ICAO and Ahmed Djoghlaf, CBD Executive Secretary.